At the heart of the Shrine of The Divine Mercy in Kraków-Łagiewniki stands the chapel where the miraculous image of Merciful Jesus and the tomb of St. Faustina are to be found. This small church, consecrated in 1891 and dedicated to St. Joseph, was built within the complex of the convent of the Sisters of Our Lady of Mercy and once served only the Sisters and their wards. This chapel has since witnessed the prayer of the Apostle of The Divine Mercy and the extraordinary graces (including the revelations of Jesus and the Blessed Mother) received by her in this place. With her death, the message of God’s Mercy, which by the will of Christ she gave to the Church and the world, was deposited in this place. For this reason the Łagiewniki Shrine became the centre of devotion to The Divine Mercy, the place from which this message is spread throughout the world and the place to which people from every continent come on pilgrimage. They come asking for many graces, to which the votive offerings in the display cases around the chapel bear witness. The miraculous image of Merciful Jesus painted by Adolf Hyła is placed above the side altar on the left side of the chapel. It was blessed by Father Józef Andrasz SJ (Sister Faustina’s spiritual director) on 16 April 1944, on the first Sunday after Easter. Copies and reproductions of the image have spread throughout the world, thereby fulfilling the words of Jesus spoken to Sister Faustina at the first of His revelations: I desire that this image be venerated, first in your chapel, and [then] throughout the world (Diary 47). A white marble coffin with the relics of St. Sister Faustina rests on the altar below this image, and one relic has been placed in a marble prie-dieu before the altar, for the convenience of pilgrims wishing to venerate her and ask for her powerful intercession through prayers to The Divine Mercy. 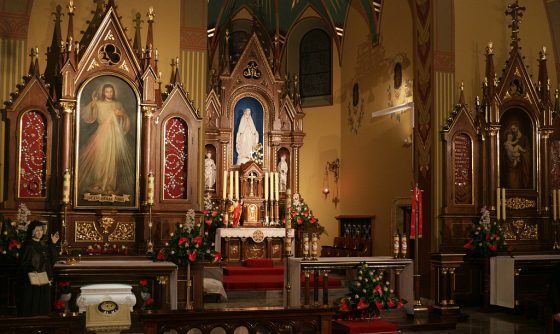 By the main altar there is a statue of Our Lady of Mercy – the patron of the Congregation, and in recesses to the side of the altar are statues of St. Stanisław Kostka – the patron of youth, and of St. Mary Magdalene – the patroness of women-penitents. At the side altar on the right there is a picture of St. Joseph with the Child, the image originally chosen as the patron of this chapel and the entire property, which was once named “Józefów” in its honour. On the side walls there are pictures: St. John Paul II, St. Ignatius – the patron of the Congregation, and Bl. Father Michał Sopoćko – spiritual director of St. Sister Faustina. In 1968, on account of the large number of pilgrims who visited the final resting-place of the Servant of God Sister Faustina, this chapel dedicated to St. Joseph was entered by Cardinal Karol Wojtyła on the list of sanctuaries in the Archdiocese of Kraków; and on 1 November 1992, the Archbishop of Kraków, Cardinal Franciszek Macharski issued an official decree raising the chapel to the rank of The Shrine of the Divine Mercy.